In the realm of "hovering" sit-stand workstations the Cadence Express breaks new ground in sharp looks, durability, range of motion, and above all, stability. At nearly 50% less cost than "high design" models like the QuickStand Lite, the Cadence Express offers a far more rigid arm mechanism for a better customer experience, while looking just as good. A five-year warranty backs up the top quality components used in the Cadence Express. Users up to 6'1" tall. Taller users should consider the original Cadence (up to 6'5" tall users). Standard Shipping of $69 in the Lower 48 states. See iMovR.com for shipping rates to AK, HI, or Canada. Ships within 5-7 days of order. Add up to 5 business days for freight delivery anywhere in the continental US. On single-LCD version, total weight with keyboard and mouse should not exceed 24.5 lbs. The most stable standing desk workstation in the "hover" category, features the best independent monitor height adjustment mechanisms in its price class, and high manufacturing quality. As elegant as it is durable. Monitor mount does more tricks than any other we've seen, including pivoting 180 degrees to make it very easy to access the monitor height adjustment knob. Any hover-style workstation is going to be less stable than a Z-lift unit (like iMovR's ZipLift or Ergotron's Workfit-T). That said, the Cadence Express is the most stable within its category. If you're looking for great adjustability and an aesthetically pleasing design, the Cadence Express does it all for a very competitive price. With a five-year warranty and high-quality components, it is built to last, unlike many of the products in this price range. While it doesn't have the fancy independent keyboard tray and friction slide monitor mount of the original Cadence, the slightly smaller size of the Cadence Express is likely to appeal to a greater number of users, and the price definitely will. 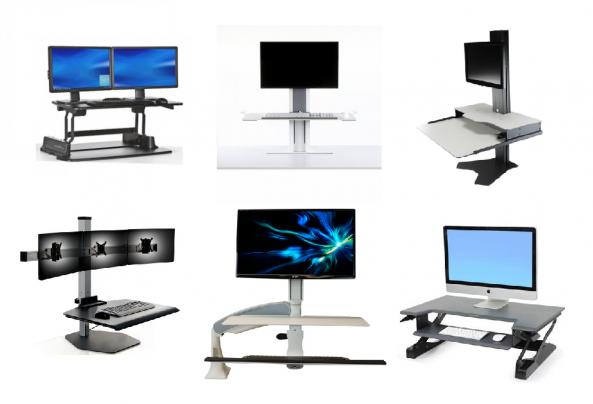 With so many new standing desk converters hitting the market it's hard to decide which one to adorn your desk with. Our advice? Start winnowing down the choices by first determining which style of workstation—post-and-base, z-lift, electric, or hovering—like iMovR's Cadence line, which now includes the Cadence Express (current review), Cadence Plus, and Cadence Pro. Hovering sit-stand workstations place the work surface and monitor mount on an articulating arm that you can think of as an oversized monitor arm. Unlike more typical standing desk converters that take up the entire center of your desk top, these “hovering” workstations—like Humanscale's Quickstand Lite, Ergotron’s Workfit-A and ESI’s Climb—preserve your desktop real estate and can easily be moved around a large three-dimensional space with just a light push. The Cadence Express is the third standing desk converter introduced by iMovR, and the second in the hover category. It is in essence a slimmed-down, weight-reduced and cost-reduced version of the Cadence—which still holds the title of "the most ergonomically adjustable sit-stand converter ever designed." While the Express does not have all the ergonomic adjustment trimmings of its big brother, it also doesn't take up quite so much space. In fact, the Cadence Express is exactly what many customers were clamoring for... a downsized Cadence for average size users—up to 6'1"—and average sized desks. (In contrast, the heavier-duty Cadence has a larger 3D movement sphere and is ergonomically optimized for people up to 6'5" in height, in addition to having a separate drop-down keyboard tray that is adjustable both in height and tilt angle.) The result of the redesign is an even more aesthetically pleasing style, and in fact the Cadence Express is the most stable unit we've ever seen in the hover category. Given that stability is generally the one thing you give up in exchange for easy access to your desk space when choosing a hover-style workstation, we were blown away with the relative rigidity of this unit. In this regard it leaves all of its competitors in the dust, especially the much higher-priced Quickstand Lite. And while we're comparing to the other hover models, the Cadence Express also beats the rest of the field in being both edge-clamp and grommet mountable (the others are edge-clamp only), and in having 6.3" of independent monitor height adjustment versus a more typical 5" range (long-torso users may rejoice). Many standing desk converters, such as the Ergotron Workfit-S, the Humanscale Quickstand, and even the classed-up Winston, use spring mechanisms to lighten the load when changing from sitting to standing height. The result can sometimes be a jerky motion or a noisy mechanism—or in the case of the Varidesk models, both jerky and noisy. The Cadence Express uses a gas piston for a smoother and quieter mechanical counterbalance mechanism, similar to what is used in the Cadence, and other hovering arms such as the Quickstand Lite and Workfit-A. As with the iMovR Cadence, we were impressed with the Express's high-quality manufacturing tolerances and componentry. The Cadence Express arrived at our test lab in excellent shape, securely packaged in layers of foam and cardboard—well protected from potential shipping damage. Assembly is a straightforward process, and significantly easier than putting together a Cadence, just given the lighter weight of the unit and the reduced number of individual parts. The first step is to install the base, either clamped onto the back edge of the desktop or mounted through a grommet hole—components are included for both methods of installation. The base can attach to any desk at least 3/4" thick, and up to 2" thick is grommet-mounting, or 2.5" thick if edge-clamping. You have the option of "over or under" mounting of the work surface—under-mounted the work surface leaves the top completely clear of obstructions; over-mounted the work surface allows it to lay completely flat on the desk when brought down to a sitting position. The MDF work surface is a slender 5/8" thick, in a durable, deep-black lamination. While the steps are fast and easy, it really helps to have a friend hold the work surface in place for you for that last step. We'll have a video of the installation process up shortly. In the meantime you can check out the Installation Manual here. Like iMovR's Cadence—and their Z-lift style converter, the ZipLift—the Cadence Express features a strong 5-year warranty, but given its heft and quality of construction one imagines a much longer life expectancy from this product. This is something we can’t say about the ever-popular, but cheaply-made Varidesk workstations, whose skimpy one-year warranties aren’t much of an issue because so many users upgrade to something better in less time than that. There is actually an industry standard for testing sit-stand workstations, which involves cycling from sitting to standing position no less than 10,000 times. The Cadence Express has been tested to 20,000 cycles—other manufacturers do not publish this specification (and based on our lab testing, many do not bother with reliability testing). Learn more about how we test products we review. The Cadence Express has built-in cable management clips that run along the underside of the arm, making for a tidy setup. Available in silver or black, the Cadence Express makes a very elegant addition to any desk, and is quite suitable for reception desks. This is not something we can say about all desktop risers. Some, like the Kangaroo and Varidesk, have too many exposed mechanisms and not enough industrial design to be compatible with high-decor office environments like law firms or ad agencies. The Cadence Express will sit pretty in even the most posh of offices, or for that matter, in the kitchen or home office. 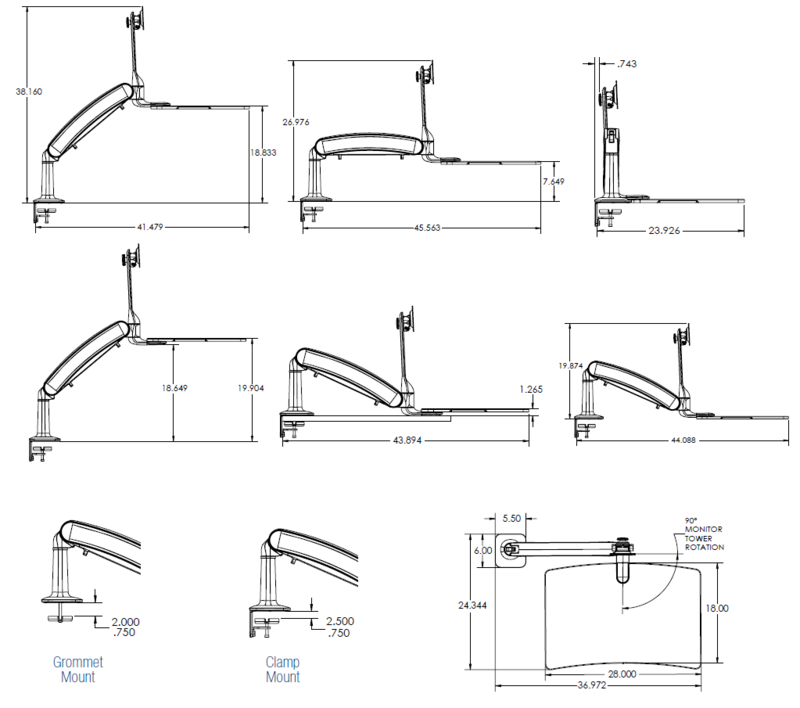 One of our chief complaints of risers in this price category is the lack of independent height adjustability. This is an important factor since most people find they need more height between their keyboard and monitor(s) when they stand up. While other sit-stand converters make you get behind the unit to change monitor height (e.g. Helium), get out the toolbox (e.g. Winston), or reach behind the monitor to manipulate a knob (e.g. Kangaroo), the monitor tower on the Cadence Express pivots 180° (otherwise known as "monitor pan angle"). This allows you to reach the adjustment knob extremely easily and make a monitor height change in seconds instead of minutes. While we've seen literally dozens of sit-stand converters in our test labs, we've never seen one in this price range that makes independent monitor height adjustment so easy. But that's not all. The monitor mount allows you to tilt the screen up all the way to +40º and down to -5º, which is more than any of the other popular desktop riser models. And you can rotate your monitor +/- 90º to switch from landscape to portrait mode. Lastly, as with the Cadence, the Express has a quick-release connector plate that you first attach to the back of your monitor, and then slip onto the monitor mount in seconds. This makes attaching the monitor to the Express extremely easy, without the help of a friend. So what is the point of a “hovering” standing desk converter? Space, for one. Conventional desktop converters take up a substantial amount of your desk space. This may be a minimal inconvenience for some users who treat their sit stand workstation as if it were a complete desk replacement—they may only need enough space for their keyboard and mouse, and maybe a few documents. But users with a lot of work material and greater space needs will want a device that still lets them keep their workspace intact. 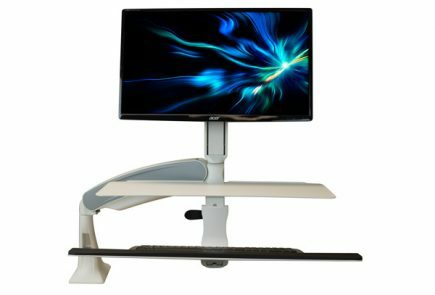 Because the Cadence Express (as well as the original Cadence) “hovers” above your desk rather than sitting on top of it, you have the benefit of a sit stand workstation, in addition to keeping virtually all of your desk space. Another benefit to this “hovering” style of standing desk converter is that it’s incredibly mobile. Conventional workstations—something along the lines of the Ergotron Workfit-S or the Humanscale QuickStand—clamp onto your desk, affixed in place. Freestanding workstations like the Kangaroo or the Helium are a step in the right direction—they sit atop heavy bases that slide along your desk top to wherever you need. But even these require plenty of clear, uninterrupted table space to move around. Hovering-type workstations literally rise above all the clutter, allowing you to swing your work surface from one side of its considerable horizontal and vertical range to another without interrupting your workflow. Its range of motion draws a giant hemisphere of 91” in diameter and about 45” in height (depending on the size of your monitor). For these reasons, this type of workstation is a favorite in collaborative offices where users work around the same screens, either with co-workers or clients. They’re also super popular in the healthcare space, where administrators struggle to keep up with massive paper flow and love the ability to push their workstations out of the way and bring them back as needed. Having reviewed and sold countless sit-stand converters over the years we’ve become big fans of the hovering architecture. It isn’t perfect for everyone—for example, it’s not stable enough to use with an under-desk treadmill—but it fits many users’ needs to a T.
The Cadence pushed the envelope for sit stand converter ergonomics, but its 3D sphere of movement is quite large—great for users who have the space. The Cadence Express has a slightly more modest sphere of movement, but probably more appropriate for the majority of potential users. It's slimmer, lighter, and a bit less mechanical in its appearance, to the point of competing head-to-head with the high-design QuickStand Lite in the looks department—and for a lot less money. Its “hovering” design preserves your most valuable desktop real estate, allowing you to maintain all of your work and equipment while still enjoying the benefits of a sit stand workstation. It outshines its competitors in styling, stability, durability and value for the dollar.